What Can I Learn in an Online Master’s in Computer Science Program? What Can I do with a Master’s in Computer Science Degree? How Much Can I Make with a Career in Computer Science? Earning an advanced degree in computer science can help you stay ahead of the game by allowing you to develop a solid, fundamental knowledge base and the ability to adapt to continually changing software technologies and applications. A flexible, online degree program can also help you meet your individual career and educational needs with less disruption to your schedule. Find out the best online master’s programs in computer science and how they’ll help you advance in your career. There are many factors students should weigh when considering which program is right for them. To help students choose the best online master’s in computer science program, we’ve ranked the top programs based on data from the Integrated Postsecondary Education Data System, the U.S. Department of Education and the universities themselves. Each program included in this list has been accredited. Saint Leo University offers an online master's degree in business administration with an emphasis in cybersecurity management for students looking for a computer science-related degree. There are 6 terms for students to enroll in the program and courses run for 8 weeks. The Master of Business Administration in Cybersecurity Management degree can be completed in 1-5 years. There is an MBA Online Academic Achievement Scholarship available to students enrolled in the program, in addition to other financial aid opportunities available through the college. 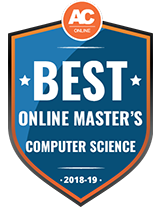 Students interested in designing, analyzing and implementing software can apply for the University of Illinois at Springfield's online master's in computer science degree program. There are also classes available that address cybersecurity and information assurance, for students who would like to design and implement cybersecurity, or who are interested in policy around security and information assurance. 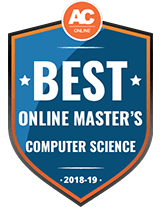 The online Computer Science Master's Degree program admits students in a cohort to complete the 2-year program together. There are financial aid resources available to online students attending UIS, including scholarships, grants and loans. Davenport University offers a master's degree in computer science that can be completed entirely online. The program is designed to prepare students to enter the field of information technology and software development. Students earning a Master of Science in Computer Science through this program choose to specialize in computer science or security. Davenport accepts a range of financial aid from federal, state, institutional, foundational or private sources. The college's Military and Veteran Services office can help students in the military apply for college and utilize their aid to pay for their degree. Students interested in expanding their knowledge in computer science can enroll in Capitol Technology University's online master's degree program to advance their skills. There are 3 specializations available in information architecture, network security or advanced computer science. Classes are offered in a 16-week, asynchronous format. The Master of Science in Computer Science program prepares students to pursue careers as data scientists, IT managers, network engineers or software analysts. Online students can apply for a range of financial aid opportunities, including loans, military aid and federal aid. The University of Idaho offers a master's degree in computer science through the college's Engineering Outreach online format. There are thesis and non-thesis options available. The Master of Science in Computer Science degree prepares students to develop advanced computer concepts and applications in a range of fields. Online students in the program can apply for federal financial aid or scholarships to help pay for their degree. U of I also offers career services to students, including interviewing tips, resume and cover letter advice and job search resources. Students interested in earning a graduate degree in computer science can find an online master's program at Dakota State University with flexible start times in fall, spring and summer. DSU's Master of Science in Computer Science focuses on practical applications of an upper-level computer science degree. Students choose to specialize their studies in this degree program, choosing 5 courses in a topic of interest. Graduates can pursue careers as cybersecurity specialists and software developers, among other careers in coding and tech or move into doctoral studies. National University's online master's in computer science degree program is designed for current professionals with a background in computer science who are interested in advancing their careers. Applicants should hold a bachelor's degree in computer science or engineering, software engineering or information systems, though students with other bachelor's degrees can apply if they complete the program's prerequisites. The Master of Science in Computer Science program requires students to complete a capstone project to earn their degree, teaching them to apply their knowledge to solve a current technological problem. University of Minnesota - Twin Cities offers an online graduate degree program in computer science that explores research, theory and applications of computer science. The online Master of Science in Computer Science can be taken as a thesis program, a project program, or a coursework-based project program. There is also an online Master of Computer Science degree that is coursework-only available through UMN Twin Cities. Online students may be eligible for financial aid and may receive discounted or in-state tuition rates depending on a student's circumstances. Colorado State University provides a graduate degree in computer science through an entirely-online format. Applicants should be fluent in an object-oriented coding language. The online program follows the on-campus course format but can be completed on a self-paced schedule. Graduates from the Master of Computer Science program can explore careers in computer software, the tech industry or aerospace companies. Online students at CSU can apply for a range of financial aid opportunities, including federal aid, scholarships and military aid. An online master’s in computer science usually takes about two years of full-time study, or three to five years if attending part-time. The curriculum covers software and web-based applications, programming languages and managing complex data structures including computer architecture, operating systems and artificial intelligence. Students attending an online program will have access to the same content and faculty as students attending classes on campus. Given the nature of the work, a master’s in computer science is well suited to online learning, which offers more flexibility at a reduced cost. What’s the difference between a master’s in computer science and an MBA in computer science? Both a master’s degree in computer science and an MBA with a specialization in computer science will help professionals advance in their careers. But while a master’s degree will provide in-depth education in the technical aspects of the field, the MBA program is designed to offer broad-based business management skills with a focus on the computer industry. Students interested in pursuing programming, software development or other technical careers are well served by a master’s program, while those interested in managing tech companies or departments may prefer an MBA. What common courses are offered in a master’s in computer science program? Students will learn about standard and recent architectural concepts, numeric data representation, assembly language organization, memory addressing, memory systems, coding and compression, input/output structures, and functional system and CPU organization. Topics covered can include analysis of time and space complexity of iterative and recursive algorithms and performance bounds, data structures design for efficient performance, sorting algorithms, probabilistic algorithms, strategies, algorithms on graphs and np completeness. Studies include the principles and approaches to programming languages such as syntax study, semantics, and pragmatics, and major programming paradigms (imperative, object-oriented, functional and logical). Topics covered can include an overview of computer networks, TCP/IP protocol suite, computer-networking applications and protocols, transport-layer protocols, network architectures, IP, routing, link-layer protocols, local area and wireless networks, medium access control, physical aspects of data transmission and network-performance analysis. Students can expect to learn about computer operating system design, including multiprogramming, time-sharing, real-time processing, job and task control, synchronization of concurrent processes and processors, resource scheduling, protection and management of hierarchical storage. Other topics covered include mathematical properties and usage of database programming languages, methods of database design and conceptual modeling, methods of physical storage for database information, and concepts of concurrency control and recovery in database systems. This course covers subjects such as design and implementation of intelligent computer systems, intelligent search, adversarial search in games, reasoning with graphical models, reinforcement learning and connectionist machines. Graduation tracts vary between programs, but students are often allowed to select from an exam, thesis or project option in order to complete their degree. A thesis in computer science may involve a design project or laboratory research. Final projects are often similar in scope to a thesis, but the topic is often chosen by the graduate professor rather than the student, unlike a thesis. A final exam will test students on the core concepts covered throughout the entire master’s program. What specializations are available in a master’s in computer science program? There are almost 20 different possible specializations in a master’s in computer science program. A few of the most common specializations are listed below. AI includes the study of principles and techniques, topics such as logic, probability, and language, knowledge representation and logical reasoning, robotics, probability models and inference, natural language processing, and machine learning. This specialization also includes applications in biology and text processing domains. This specialization covers database and information management systems, and techniques for mining massive data sets. Topics include developing applications for database and information systems, system design, architecture, and management, applying algorithms and techniques from data mining and machine learning to perform analyses of bioinformatics, web searches and social media applications. This specialization covers a broad array of topics including courses in networking, operating systems, web applications, security, cryptography and interface design. Students learn how to organize domains to connect many sets of topics across engineering. They learn to connect both mathematical and psychological theories and system building. Focus is placed on the sociotechnical nature of modern systems design. In this specialization, students explore programming systems and languages, compilers, and databases, learning how to build an operating system, router, and take intensive programming courses. They apply programming languages and applications to areas like security. SDEs build, design and maintain systems and software in virtually every industry. With a wide range of possibilities, professionals in this area have backgrounds in computer software applications, or computer software systems. Skills are used to analyze needs, test, design and develop software theories and principles. Computer scientists develop a wide range of computer-based tools specific to the industry involved, including database design, algorithm development and other processes to increase system efficiency and productivity. Knowledge of programming languages such as SQL, C++, Python, Java and XML are important in this type of position. To work in this field, a specialization in networking and IT security systems is useful to develop and implement security systems and protocols. Professionals diagnose security systems and create solutions for defense layers, firewalls and detection systems that help fend of cyber attacks. Additionally, individuals in this field test hardware and software, and perform regular system testing. As technology takes over every aspect of life, mobile application developers are in high demand. They are responsible for developing applications for mobile devices, and need to be well versed in programming languages, mobile operating systems, and user experience. A specialization in mobile and internet computing helps develop the skills necessary to perform this job. Professional organizations not only help connect graduates with other professionals in the field, but also to stay abreast of the most current industry standards, trends and technologies. A few of the top organizations are listed below. A worldwide organization that promotes computing professions. Publications available to members include a newsletter, the latest industry news, a student magazine and a quarterly email newsletter highlighting opportunities for professional growth. With over 4,000 members in the many fields of computer science and technology, this organization has supported computer science and technology since its inception in 1937. Members receive subscriptions to publications, service member discounts, free online seminars and voting rights. The IEEE Computer Society provides research, networking and professional development opportunities to its more than 60,000 members worldwide. It sponsors over 200 technical conferences each year and publishes 30 journals and magazines. AAAI promotes understanding, and responsible use, of artificial intelligence through seminars, conferences and a quarterly newsletter. It also publishes books and awards scholarships. There are a large variety of computer science positions available, especially for those with a master’s degree. Here are a few possible positions and their median salaries, though students should note that a master’s degree in computer science won’t guarantee eligibility for any position and that some may require additional certification or training. Projected job growth in many computer science professionals is much higher than the average rate of 8 percent and salaries also tend to be significantly higher than average salaries as well. With this kind of earning potential and job prospects, money spent on a online master’s in computer science has the potential to pay off handsomely. Going the extra mile to earn a master’s degree usually results in substantially higher median wages. According to Georgetown’s Center on Education and the Workforce, the median wage for a professional with a bachelor’s degree in computer science is $83,000 compared to $100,000 for those holding a graduate degree. Prospective students should consider online master’s degree programs in computer science that are accredited. Accreditation ensures that an independent agency has confirmed the quality of the program’s curriculum, faculty and research. Look for accreditation from the Computing Accreditation Commission at the Accreditation Board for Engineering and Technology (ABET). ABET has accredited over 3,800 programs worldwide. Accreditation from CAC/ABET ensures the program meets high standards for technical education and improves your job prospects since many employers require a degree from an accredited program. Accreditation may also be required to get licensed or certified in your area of specialization. Oftentimes, the biggest obstacle to pursuing graduate studies is figuring out how to pay for it. Fortunately, there are many opportunities for students to get financial aid to help cover the cost of a master’s degree in computer science. The best place to start is by filling out a Free Application for Federal Student Aid (FAFSA). This will determine a student’s eligibility for federal loans, grants and assistantships in a graduate program. In addition, because of the rapid growth in the field, more agencies are funding scholarships to ensure there are enough graduates to fill the increased job openings. Below are just a few examples of the scholarships available to students pursing an online master’s degree in computer science. This scholarship, funded by the National Science Foundation, offers scholarships of up to $34,000 to students who commit to working in cyber security for a government agency after graduation. They must commit to working for the government for the same amount of time that their scholarship lasted. Previously the Google Anita Borg Scholarship Program, this is a Google-sponsored scholarship for women pursing degrees in computer science. Awards of $10,000 will be given to recipients who show academic achievement and community leadership. This scholarship is for student members of the IEEE Computer Society and provides support of $1,000 or more to students studying computer science.